One of my favorite Tattoosday encounters involves Kristina, who I featured here back in 2010. As I recall in the post, I had originally met Kristina in Manhattan a couple years earlier, and had run into her again in my neighborhood when we were both picking up our kids from camp. We've since become friends and I've kept up to date on some new tattoos she has had inked since we last featured her on Tattoosday. Over the summer, we finally had a moment to stop, talk, and take pictures of her newer tattoos, both of which were tattooed by the fantastically awesome Virginia Elwood of New York Adorned. She loves birds and the emblem on the chain was Elwood's idea. Kristina had wanted a compass but, as she put it "Virginia-ized." She added, "she [Elwood] does these beautiful geometric flowers like a spyrograph - I wanted it in that style." Kristina's son Oscar told her to get a crane, "which originally scared me," she said, "because he was little and I thought he meant a construction vehicle." Clicking here will show you all the work I've featured by Virginia before on Tattoosday. Some day, I hope to get work from her, as well. Thanks to Kristina for sharing her birds with us here on Tattoosday! This concluding segment was really cool. There's less tattooing and more about the relationship between Valerie and Stewart Robson. You see them hanging at the zoo and it's really interesting to see them and their reaction to some of the animals. This is definitely a great series! These are the characters Pumbaa (top) and Timon (bottom) from the Disney animated film The Lion King. Timon is a meerkat and Pumbaa is a warthog, and both were the characters providing comic relief in the film. "Why did you get Timon and Pumbaa?" I asked. "They are my idols," he told me. Emil credited an artist named Richard Holm at Magic Man Tattoo and Art in Skövde, Sweden. 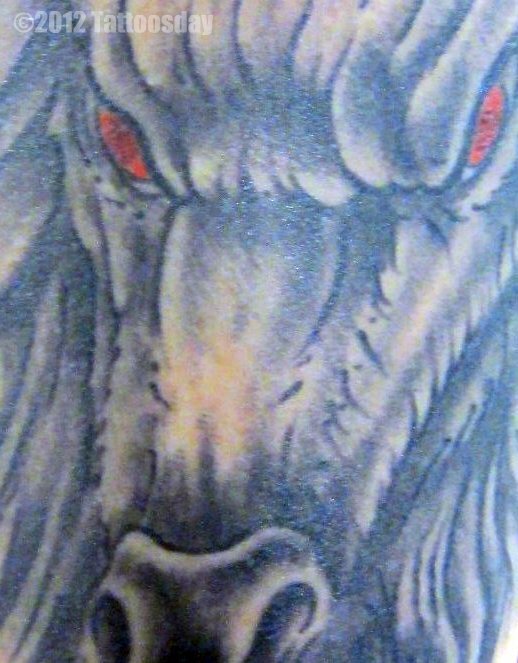 Believe it or not, these are not the first tattoos we've come across from Magic Man Tattoo. A piece was featured previously here, back in 2009. Thanks to Emil for sharing his tattoos with us here on Tattoosday! 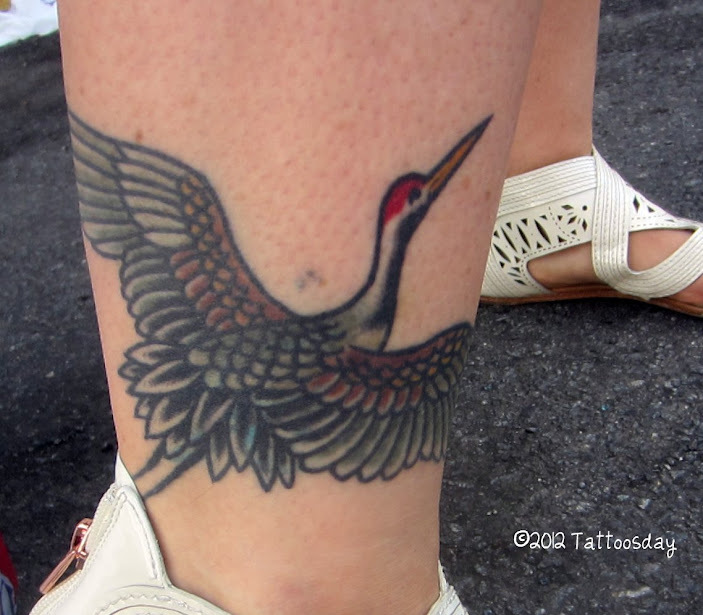 I'm still marveling over the cool tattoos I spotted at the Coney Island Mermaid Parade back in June. This piece was done by Nick Caruso at Bound for Glory Tattoo on Staten Island. Work from Nick has appeared previously on Tattoosday here. 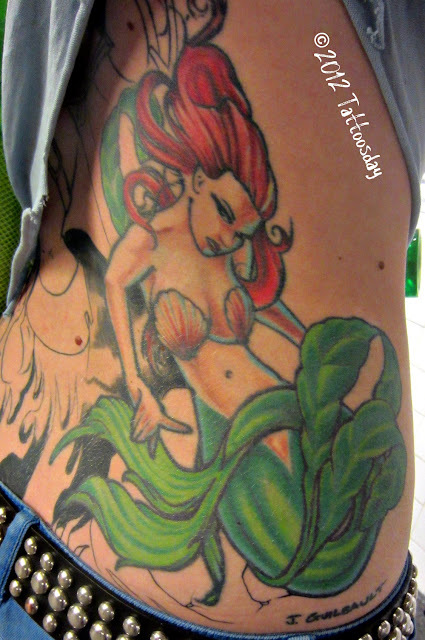 You can tell Stefany has a lot of amazing work, including the seascape down on her ribs and hip, as well. Thanks to Stefany for sharing this beautiful tattoo with us here on Tattoosday! 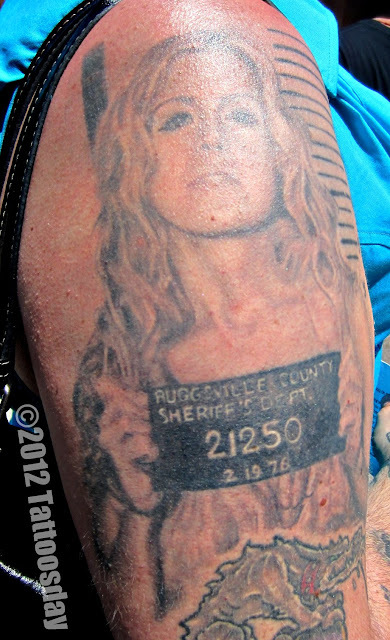 Sometimes some people's tattoos are just destined for Tattoosday. Case in point: this past July I was traversing the Brooklyn Bridge with family and some out of town friends. On the way down the bridge into Manhattan, a guy passed me walking toward Brooklyn. He had an amazing, colorful tattoo on his left arm. Under normal circumstances, I would have stopped him, but we were going different directions and the bridge was crowded. It was a hot day, so we paused for some water at the bottom of the bridge before crossing into City Hall Park. There were seven of us in all and we were hanging by the Jacob Wrey Mould fountain when, who should I see, but the guy with the tattoo I so admired. Rather than crossing into Brooklyn, he had returned to Manhattan. It seemed appropriate to save this tattoo for the first full day of fall (I know it started yesterday, but technically not until 10:49 a.m. E.S.T.). Matthew explained that this tattoo represents "where I've started [and] what I've grown to be." He added, "I got the colors because my birthday is in the fall ... so autumn colors, as well as, it looks more like a Dr. Seuss, so it's different than anyone else's tree tattoo." I couldn't agree more! The artist is Craig Secrist at Ironclad Electric Tattooing in Salt Lake City, Utah. Thanks to Matthew for sharing this awesome tattoo with us here on Tattoosday! This half-sleeve of falling leaves belongs to Domenic, who I met in Penn Station back in early July. He credited the artist Laura Usowski at Lovecraft Tattoo in Hamden, Connecticut. He says he wanted something representing fall and Laura designed the tattoo. She did a great job! 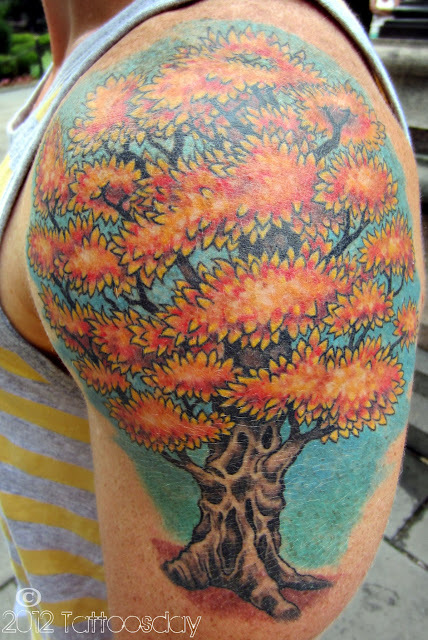 Thanks to Domenic for sharing this tattoo which we here think is a perfect tattoo for the first day of fall! As many might guess, this tattoo is astrological in its origin, and reflects that Chelsea is a Pisces. She said that tattooer is a free-lance artist in Brooklyn named Vega. Thanks to Chelsea for sharing her tattoo with us here on Tattoosday! 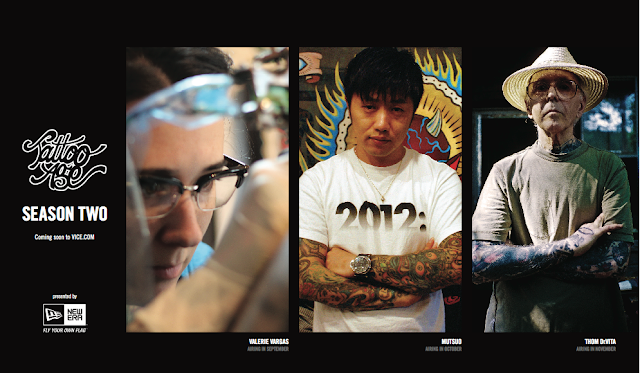 Tattoo Age on Vice: Valerie Vargas Part 2 is Now Up! So we here at Tattoosday have committed to keeping our readers up to date on the new installments of Vice's amazing "Tattoo Age" series. Earlier this month, I headed to the Carroll Gardens section of Brooklyn on a mission - Melanie had sent me to Shelsky's Smoked Fish on Smith Street to fetch her some, well, smoked fish. Shelsky's has amazing lox, herring, and other tasty treats that cater to that refined palate. They also make some amazing sandwiches, flavored cream cheeses, and salads. I enjoyed their horseradish cream cheese and their citrus-roasted beet salad. Melanie's still kvelling about the thinly-sliced pastrami lox and house mustard herring. But, I digress. 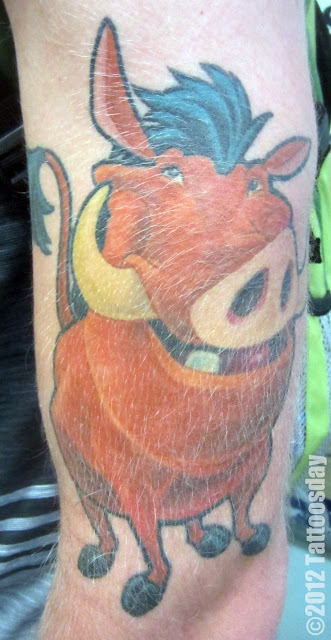 "My tattoo is an old-fashioned butcher's diagram of a pig. He is running into my Nenox chef knife which is above the elbow. I got them done in 2009 after eating pork every day through 2008. I decided on New Year's eve 2008 that I wanted to make a resolution that I knew I would gladly commit to. Eating pork every day of 2008 was that resolution, and I did it. Pork is my #1 favorite meat. The pig is a miracle animal. You can use every single part of the pig. So, naturally, the tattoo just made sense to me. The juxtaposition of me owning a Jewish appetizing shop, and working behind the counter with a pig tattoo on my arm is great. It's a conversation starter, and I really like that. I'm sure some folks are offended by it, but that's life." Peter's tattoos were inked by Robert Bonhomme at Brooklyn Tattoo. I reached out to Adam Suerte at the shop, since Peter told me that Robert had moved on. Adam informed me that Robert is now working out of Hand of Glory in Park Slope. Yom Kippur!" Check their full menu out at www.Shelskys.com! Thanks to Peter Shelsky for sharing his porcine tattoo with us here on Tattoosday! And Happy New Year to all! I hadn't prepared a post for today but a friend messaged me on Facebook with this link, which shares "11 Amazing Library Tattoos". Gatsie told me that this work featuring sea turtles, jellyfish and a shark, was originally a cover-up and it was done by Matt Skinner at Royal Street Tattoo in Mobile, Alabama. Gatsie was kind enough to send me some other pieces she's had done at Royal Street, as well. Needless to say, she's a huge supporter of the shop. 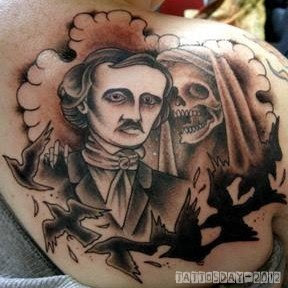 This literary tattoo features Edgar Allan Poe and some ravens. This was done at Royal Street, as well, by Pete Anderson. 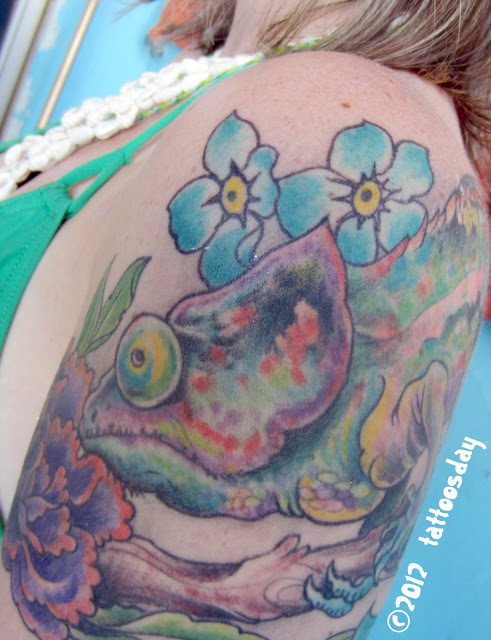 Thanks to Gatsie for sharing her tattoos with us here on Tattoosday! We'll be sure to check out Royal Street Tattoo if we're ever in Mobile! 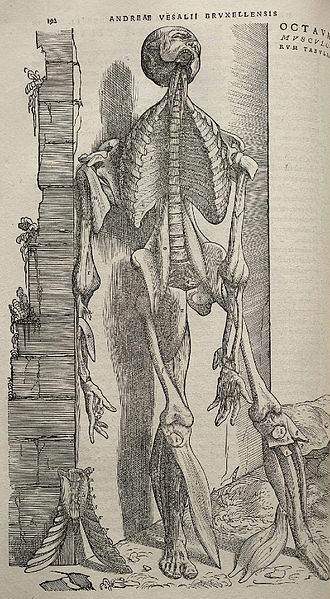 This is an image from the first human anatomy book by Andreas Vesalius, circa 1543. The tattoo artist is Needles from East Side Ink. Thanks to Marshall for sharing with us here on Tattoosday! She credits this work to Adam Jeffrey at the Baltimore Tattoo Museum. The concept of the dragon wrapping around the limb is pretty cool and Teegan explained that she and the artist "worked on the design together... going back and forth." She appreciated the fact that dragon tattoos have a whole array of traditional meanings, which contribute to her appreciation of the tattoo. Thanks again to Teegan for sharing this piece with us here on Tattoosday! She credited this piece to Casey Anderson at House of Poncho's Tattoos in Abingdon, Maryland. This is a portrait of the character Vera-Ellen "Baby" Firefly, played by Sheri Moon Zombie, in Rob Zombie's film The Devil's Rejects. This tattoo, which takes up most of Lisa's upper right arm, is attributed to the fact that, in her words, "I'm a fan of horror movies and she was a totally awesome killer in that movie and I just liked her character." Thanks to Lisa for sharing this awesome tattoo with us here on Tattoosday! Valerie Vargas, Part 1, Now Up on "Tattoo Age"
The first installment of the first feature on Vice's Tattoo Age is up now! If you really want to have some tattoo envy, just behold the amazing work of the brilliant Valerie Vargas from Frith Street Tattoo in London. We'll be posting when new installments are released. Tommy told me this is based on a Tarot Card, and that it represents a message. "I got it the same day one of my best friends passed away. I actually didn't know that happened that day. A friend of mine has a book of birthdays ... and every birthday has its own card and this is my card and I went to go get it and then later that night I found out one of my really close friends passed away. So, it's kinda like represents a whole lot more to me now." The piece was inked at Philadelphia Eddie's Tattoo Haven. Thanks to Tommy for sharing this tattoo with us here on Tattoosday! I am rarely satisfied with something from my unpublished backlog when September 11 rolls around. I have re-posted a 9/11 Memorial Tattoo several times already, so I am re-posting this one, from 2008, because it also seems like an appropriate sentiment for this day. I also like to share this poem, which I composed back in 2001. I ran into Rob in my neighborhood in late August and he gladly shared his patriotic tattoo. Rob is a Revolutionary War buff and has a distinct interest in American history. He wanted an "old school" tattoo back in 2000, and wanted something patriotic back "before it was fashionable". He's referring of course, to the explosion of post-9/11 red, white and blue ink. He wasn't disrespecting or being critical of patriotic tattoos done after 2001, he was merely clarifying for me that his piece was not a product of the huge wave of emotion that surged through the country after that day of infamy seven years ago. Rob's "Land of the free, Home of the brave" banner with the original 13-star flag was inked by Darren Rosa at Rising Dragon in Manhattan. Work from Rising Dragon has appeared on Tattoosday previously here. Thanks to Rob for sharing his red, white, and blue patriotic tattoo with us here on Tattoosday on this occasion. 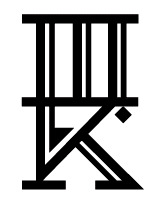 This entry is ©2008,2012 Tattoosday. Mandy explained that the original artist of this piece was the late Jason Guilbault, who worked at Addiction NYC, Their friend Eric finished the piece, adding the color and Guilbault's name at the bottom of the piece. Jason's MySpace is still active here, where you can see some of his work and see messages left in memory of him. "Why the mermaid?" I asked. "I've always wanted to be a mermaid," Mandy told me, "and now I'm going to be a professional mermaid." I asked if she was going to Florida to live out this dream, but she said she is going to stay in New York, since there are no professional mermaids in New York City. Thanks to Mandy for sharing her mermaid with us here on Tattoosday, and helping us keep the memory of Jason Guilbault alive! Anthony explained that this is an eagle, swallowing the sun. It represents being part of the earth and the sky, being one with the universe. I'll be honest with you, Dear Readers, when I managed only six posts in August, despite a backlog of over fifty subjects, I feared the worst. The fact that I only had 1 (one) reader inquiry asking if everything was okay certainly deepened my concern. You see, July 31, marked the fifth anniversary of this post, over on my original site, BillyBlog. That was 1997, and I had my most fruitful year as a blogger. 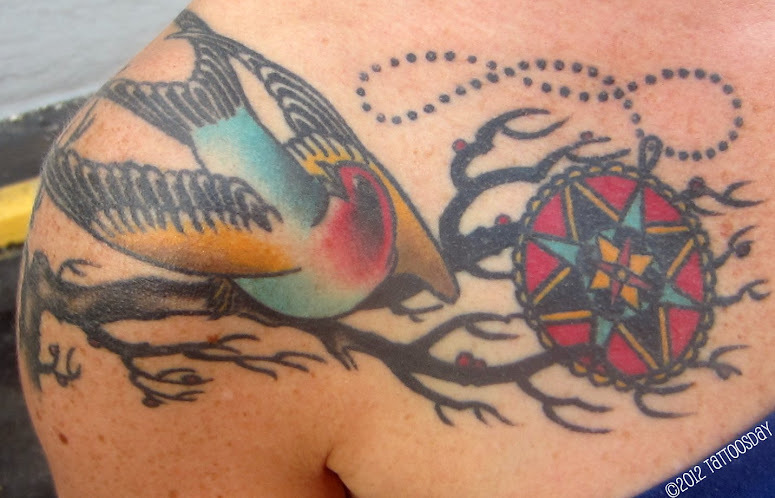 Within six weeks, my idea to highlight someone's tattoo, be it a friend's or a stranger's, had exploded. I had more material than I expected, and I loved it. So, on Saturday, September 8, 2007, after six Tuesday posts, I spun off Tattoosday into a stand alone entity. And BillyBlog hung around, and still exists, in theory, although I posted exactly three times in 2011 and three (so far) in 2012. Five years for a blog is past middle aged for this type of media. For, you see, for every HuffPo or other serious, amazing, SUCCESSFUL blog, there are thousands that don't make a year, or two. But here we are, five years old, celebrating our anniversary. And even though we officially first posted on July 31, 2007, I neglected to celebrate back then. Like I mentioned earlier, last month was bleak. 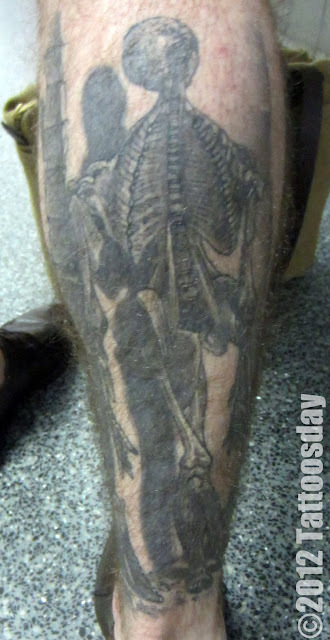 My job of fifteen years ended on August 31st and I was distracted by the closing of our company which was located across from Penn Station, where there was a prolific supply of tattooed commuters and tourists. But September, which often marks the beginning of the end of summer, prime inkspotting season, brought me renewed faith in the site, and the desire to continue through this mid-blog-life crisis. You will be seeing the standard sights from my fellow tattooed New Yorkers. My backlog, as is generally the case, stretches back several months. However, I will be expanding a bit in the format department, adding more news and media. I've been documenting tattoos in New York City (and beyond) for five years. This is our 1317th entry into that little experiment I started way back in 1997 as a once-a-week feature. 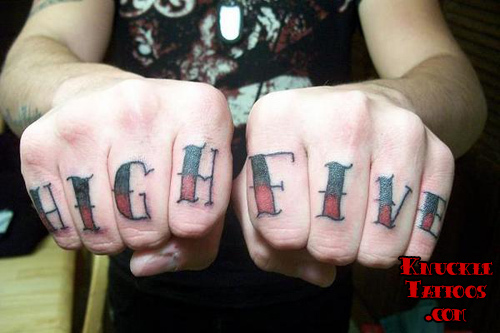 I want to thank all of our readers and contributors for their support and participation in Tattoosday. Your existence, as subjects and fans, makes my life richer, and I am humbly appreciative of your existence. Tattoo Age, Season Two, is Coming! Loyal readers who don't read any other tattoo blogs, I apologize, I may have let you down. There is a great on-line tattoo feature from a site called VICE that produces a fantastic tattoo series called Tattoo Age. They told me about it last year but, because I was more involved with my man-on-the-street posts, and because my good friends over at Needles & Sins posted about it, I made a mental note, but didn't talk much about it here on Tattoosday. But we're evolving here, and as there may be readers who don't read Needles & Sins, I would be remiss in not plugging this great series that, in its first season, highlighted the work of such amazing artists like Freddy Corbin, Mike Rubendall (of Kings Avenue Tattoo), Troy Denning and Grime. Season Two is upon us, and they will be featuring Valerie Vargas, from the UK, Mutsuo from Japan, and New York City's Thom DeVita. Each artist's spotlight is broken into three parts and, if season one is any indication, highlights their talents and skills in a great documentary style. What's nice about this series, among other things, is that they are devoid of faux-reality drama. It's just about tattooing, and by very talented folks, to boot. We here at Tattoosday will do our best to keep readers updated as to when new episodes appear online. Back in July, I attended the 2nd Annual New York City Poetry Festival on Governor's Island. Not only did I meet some great tattooed poets, I met a lot of other folks too. The festival had a few of Brooklyn's famous food trucks lined up, serving people hungry for grub and verse. Caitlin got this tattoo at East Side Ink from Patrick Conlon, who she picked because he was from San Francisco, which is where she is from as well. 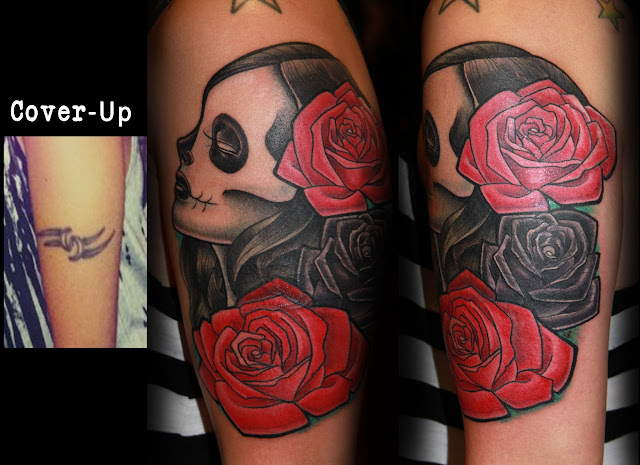 She explained that the piece is a cover-up. 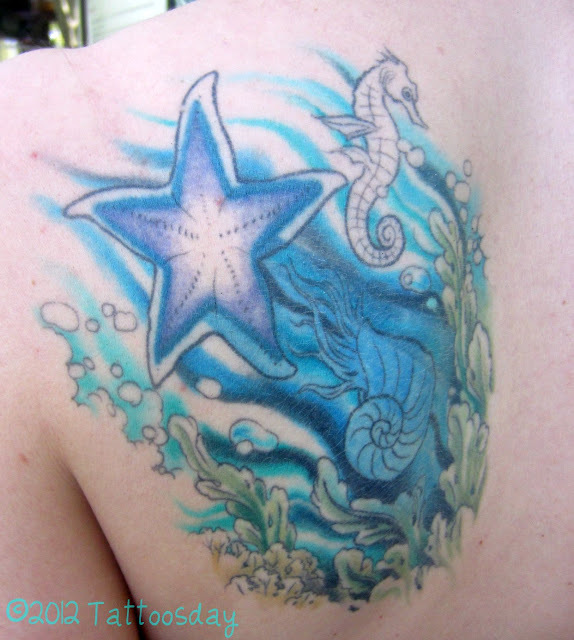 "I had a really janky tattoo of a star back there," she said, "that's where the starfish is." She had Patrick do the whole design and turn it into a seascape. 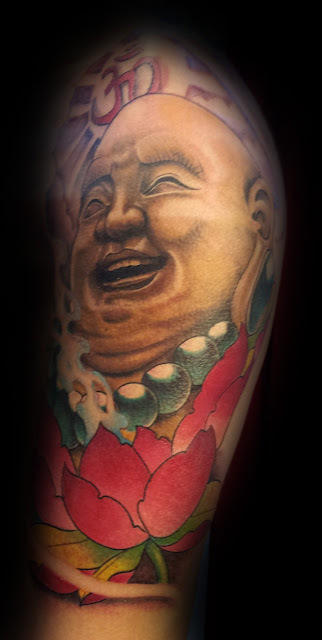 Patrick also works at Graceland Tattoo in Brooklyn, His work has been featured previously on Tattoosday here and here. Thanks to Caitlin for sharing her work with us here on Tattoosday! The pink flowers below the hummingbird are gladiolas. It's really quite an extraordinary sleeve. "It's all the birth flowers of the people in my family. 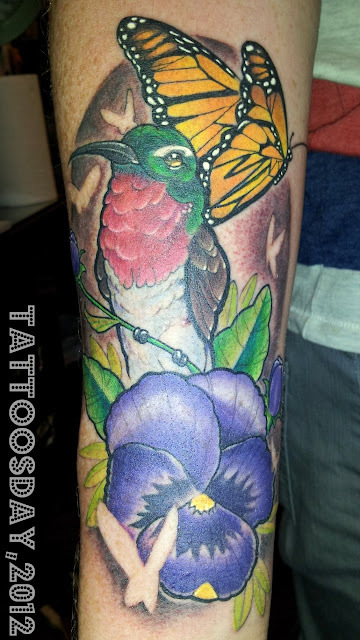 The butterfly represents change, the rose represents love, and the hummingbird is for my grandma. The sunflower is for my mom." 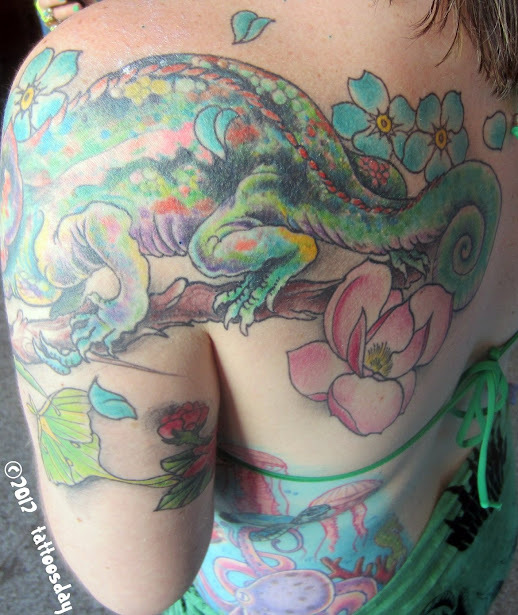 She estimates that she has spent about 55 hours under the needle for this sleeve. Megan credited Jessica Adler at Crimson Empire Tattoo in Edmonton. Thanks to Megan for sharing her beautiful sleeve with us here on Tattoosday! Trying to not to talk about the scarcity of posts back in August, we're expanding a little here, and sharing work by Rev. Jorell Elie. I am told Elie "is an incredibly talented artist out of West Hollywood, CA, who happens to travel to Brooklyn, NY quite often (this month in fact)." No arguments there. The photos were sent along to highlight the Rev. 's work. Our readers are invited to check out the website here to see some of the bigger pieces that are works in progress. Looks like the artist Rev. Jorell Elie works out of The Honorable Society in West Hollywood, CA. You can reach out to Elie at tattoosbyjorell@gmail.com, or follow him on Instagram @thejorell. And, as mentioned earlier, you can check out more of this talented artist's work at www.jorellelie.com. Thanks to Jenna Elie for sending these pictures along and alerting me to Rev. Elie's upcoming trip to New York. 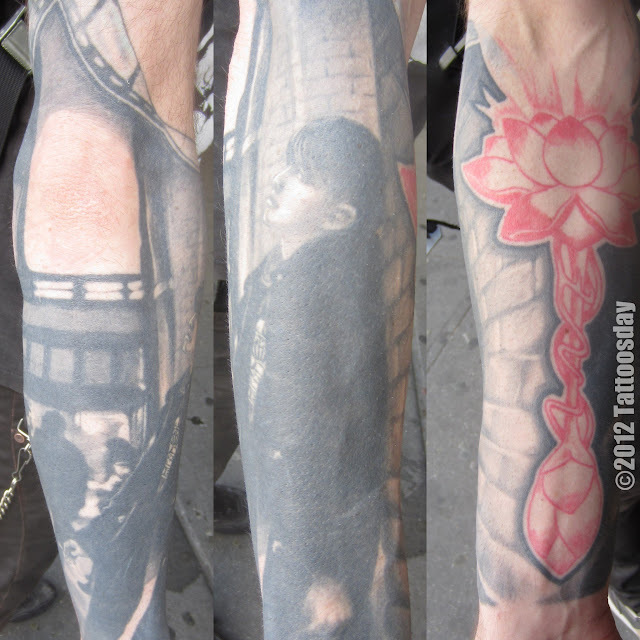 This entry is ©2012 Tattoosday. Photos reprinted by with the permission of the artist. I met Kim on the 34th Street subway platform while waiting for the A train. I thought her goat tattoo was incredible, so I just had to ask about it. 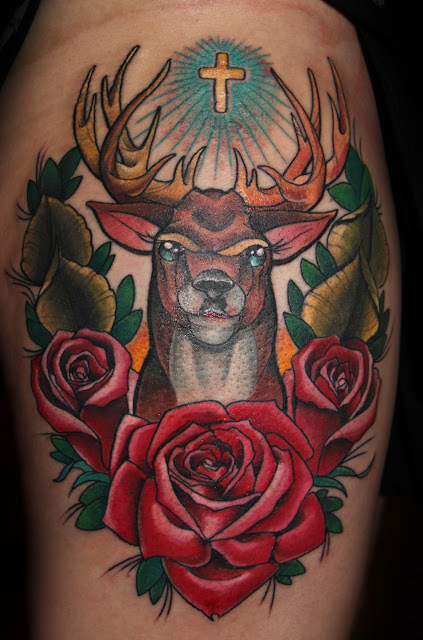 Kim credited Heath Rave from Speakeasy Custom Tattoo in Chicago for this work. The shading and texture created mostly using black and gray (with the exception of the red for the eyes) is quite excellent. There's something very sinister about the image so I asked, why the goat? Kim explained that it is "the artist's version of this really famous Black Metal iconography from a band called Bathory." Bathory is considered one of the bands from the first wave of heavy metal's "Black Metal," subgenre. 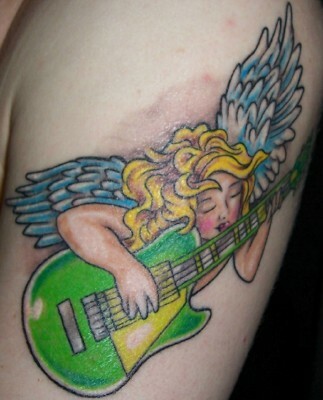 Kim is a huge fan of the music, and the image on her arm reinforces that passion. Thanks to Kim for sharing this tattoo with us here on Tattoosday! Earlier this year, I met Zachary outside of Penn Station. He had a pretty interesting sleeve and I took some photos to share on Tattoosday. "... It's actually a friend of mine ...It's a photograph that i took ... in 2003 or 4 and then I fucked up the contrast a little bit, then I brought it into the tattoo artist, handed it to her and she ... I honestly think she's the best tattoo artist I've come into contact with in New York, and I've looked a lot." The artist in question is Andreana Verona at Supernova Tattoo in Astoria, Queens. There's a nice profile of Andreana here on The Huffington Post blog. It's a spectacular tattoo, with amazingly lifelike texture, almost as if a frame of film was transposed onto Zachary's flesh. The top border appears as a strip of film folding over on the photo. It is really wonderfully done. Thanks to Zachary for sharing this cool tattoo with us here on Tattoosday! This Japanese-style rooster, accompanied with cherry blossoms, belongs to Janayna. Janayna was visiting from Brazil. I didn't get much information, other than that the artist is also from Brazil. Thanks to Janayna for sharing her tattoo with us here on Tattoosday!